1Physics Department, Addis Ababa University, Addis Ababa, Ethiopia; 2Autonomos University of Morelos, CIICAp, Av Universidad, Cuernavaca, Mexico. Received May 2nd, 2011; revised June 3rd, 2011; accepted June 15th, 2011. The asymmetric parabolic double quantum wells (DQWs) with resonant levels (the ground state energy in one well coincides with the first excited state energy in another well) is analyzed. The splitting of these levels and the tunneling times are calculated. If the typical life time of the excited state is much smaller than the tunneling time between wells, the charged particle can radiate as a result of the quantum transition from the excited state to the ground state. In the opposite case, the asymmetric DQWs can be treated as a metastable excited nanosystem regardless of that the dipole transition from the excited state to ground state is permitted. The lifetime of this metastable state can be considerably reduced by putting it into a resonant cavity. The possibility of coherent radiation of an ensemble of asymmetric DQWS is discussed. The tera hertz range of the electromagnetic spectrum spans the frequency range between microwave and mid infrared (100 GHz - 10 THz). This frequency range is still the least exploited region of the spectrum owing to the very limited availability of suitable sources and detectors [1-4]. The double quantum wells can be considered as possible sources of the terra hertz radiation [5,6]. Recently, an efficient THz generation within multiple quantum wells has been reported in . The quantum mechanical tunneling in symmetric double quantum wells is accompanied by quantum transitions between the split levels, which are used in masers [8,9]. The solution of the Schrodinger equation for the asymmetric DQWs and finding the energy level splitting to such systems are more complex than the symmetric ones. It seems that the reliable analytic results can be obtained only for the parabolic DQWs. For arbitrary wells the problem may be solved only numerically. Usage of the WKB approximation [10,11] for calculation of the level splitting can give good accuracy only for the high levels. In this paper, we consider the tunneling of a charged particle in asymmetric DQWs that is formed by applying the gate voltage to the symmetrical parabolic DQWs. By tuning the electric field, it is possible to obtain coincidence of the ground state energy in one well and the first excited state energy in another well. The quantum tunneling takes place between these levels. It differs from the tunneling between ground state levels in symmetric DQWs. In our case, the tunneling particle may execute a quantum transition from the excited state to the ground state in the same well, radiating the quantum of the electromagnetic energy, with the frequency much larger than the frequency of transitions between the doublet levels that appear as a result of splitting. Spontaneous emission from a two level atom and tunneling in a double quantum well potential was studied recently . The paper is organized as follows. In the second section, the splitting between resonant levels in the asymmetric DQWs is calculated with the help of the known eigenfunctions of the individual wells. To check this method, we calculated the splitting of the ground state energy levels of symmetric parabolic DQWs and compared it with known results obtained by other methods. In the third section, the tunneling time between the resonant levels-the ground state in one well and the first excited state in another one is calculated and compared with the lifetime of the excited state. The parameters of the metastable excited state of the asymmetric DQWs and organization of the dipole radiating state are discussed. In the conclusion, we summarize the results obtained in the paper. We consider a particle of mass and charge that moves in the 1D potential . Here we introduced the potential energies of the left and right wells (See Figure 1). as for the symmetric DQWs. and the left well is lifted by . Figure 1. 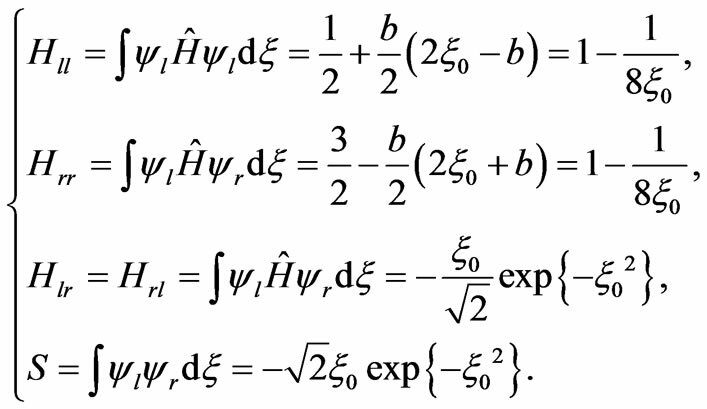 The low lying energy levels in the left and right wells (equation (4)) do not coincide at arbitrary electric field. There is no tunneling in this case. Multiplying (8) by and according to (6) and integrating over , we obtain a system of two linear homogeneous algebraic equations for land . Figure 2. The asymmetric DQWs with resonant levels: the ground state energy of the left well coincides with the first excited state energy of the right well. The tunneling is possible. symmetric double quantum wells (no external electric field). 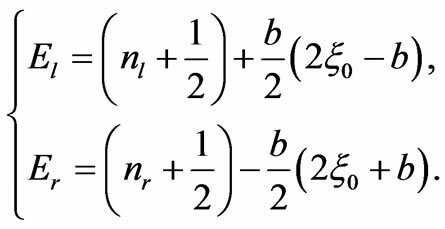 This can be considered as a confirmation of the result (13) obtained with the help of the known wave functions of “far” separated wells. where is the splitting given by (13). This shows that the charged particle in the asymmetric DQWs oscillates back and forth between the resonant states and with a frequency in the left and right wells, respectively. This oscillatory “motion” can also be considered as a quantum mechanical tunneling. Now it would be relevant to discuss how to realize the state of the asymmetric DQWs with the tunneling electron. Let us consider the symmetric DQWs that could be obtained if the electric field in (1) is set to be zero. The ground state of this problem is the energy doublet (14) with the electron tunneling between the wells. If we switch on a very weak but finite electric field, the resonance of the ground state levels will be violated. The level in the left well will be slightly higher and the level in the right well will be slightly lower comparing with the ground state energy at . 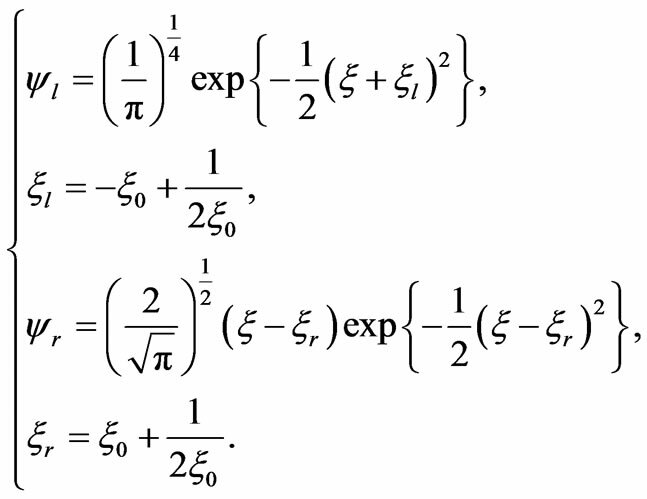 The electron is captured by the left or the right well with a probability 1/2. 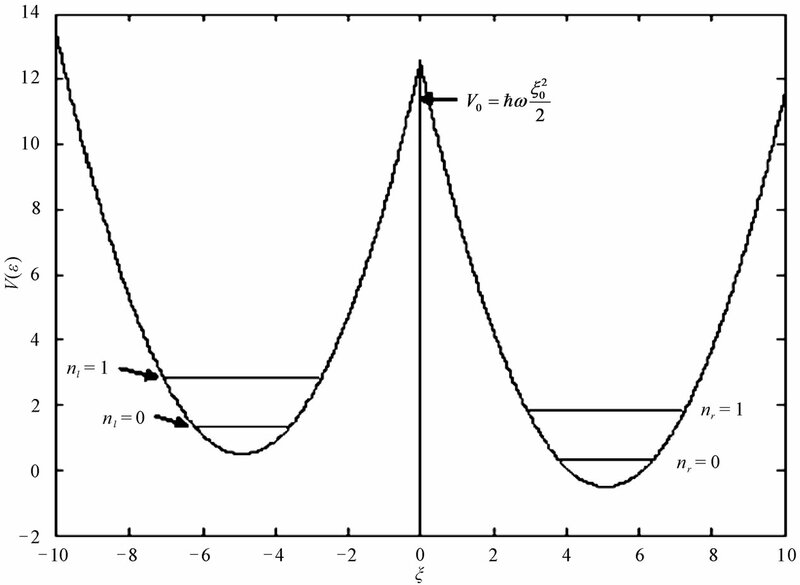 Increasing the electric field up to the value (5), we meet the resonance condition of the ground state level in the left well and the first excited state in the right well (see Figure 2). If the electron was in the left well, it will be in the tunneling regime. If it was captured in the right well, it will stay on the ground state level. The probability of realization of these states is 1/2. If we have an ensemble of asymmetric DQWs, half of them will be in the tunneling regime and can be treated as excited states. Below we deal with these states. where . It satisfies with and allows us to find the frequency for a given or vice versa. For example, exploiting the terra Hz frequency range, we obtain that for 10 THz, nm and for 1 THz, nm. We can see that realization of the above proposed mechanism of radiation of the resonant levels requires the nanoscale DQWs. With the help of (5) and above obtained and one can estimate the gate voltage and corresponding strength of the electric field required for formation of the resonant levels in the DQWs. The results read: for 10 THz, nm, V and V/cm; for 1THz, nm, V and V/cm. These fields can be easily obtained in laboratory. It is necessary to remember that formation of the resonant levels requires the fine tuning of the gate voltage. On the basis of the above report, we can claim that the asymmetric DQWs with resonant levels: the ground state in one well and the excited one in another well may be a source of spontaneous radiation in a THz frequency range. After emission of the quantum from the right well, the electron stays in the ground state of the right well. If we change the direction of the electric field, the system will be again in the excited state during the time . The lateral current pumped GaAs/AlGaAs quantum wells were used as a source of incoherent THz radiation in . Now we consider the case when inequality (22) is reversed. In the THz frequency range for the accepted model it requires that a distance between the wells be smaller than (45 nm for THz and 140 nm for THz). In this case, the electron “jumps” between the wells so fast that it has no time to make a quantum transition in the right well from first excited state to the ground state. In other words, the system will be in the excited state with the electron tunneling between the wells. We consider this state as a metastable nanosystem. where is a typical time of the stimulated emission, and is a density of the external radiation of a frequency . It is seen from (23) that at , the life time of the system with respect to stimulated radiation can be made much smaller than the tunneling time (17). It is necessary to note that low lying energy levels of a harmonic oscillator are equidistant with spacing . The equidistance between levels is violated by the splitting of resonant levels, which depend on the number of levels. However, the other models of asymmetrical DQWs (for example, rectangular DQWs with a gate voltage) do not possess the equidistant resonant levels and the problem of re absorption will be removed. The possibility of the generation of the THz radiation in resonant tunneling structures with several quantum wells was discussed in . Moreover, it is claimed in  that the combined effects of the static electric field and the THz coherent radiation field can be useful in designing new optoelectronic devices. In this paper, we obtained the condition of formation of the resonant levels for a model a charged particle in parabolic DQWs with an applied electric field. The tuned electric field provides the coincidence of the energies of the ground state in one well with the energy of the first excited state in another well. The account of degeneracy of the quantum states in the wells results in the splitting of the two-fold degenerate level and in the tunneling of the particle between the wells. The typical time of tunneling or the time staying of the electron in one of the wells is calculated. But unlike the tunneling of the particle in the ground state of a symmetric parabolic DQWs now the electron may execute also a spontaneous quantum transition from the excited state of the well with radiation of a quantum provided that is much larger than the typical life time of the excited state . In the opposite case , the asymmetric DQWs under consideration may be treated as a metastable nanosystem. The radiation time of the asymmetric DQWs with parameters placed into a resonator of the frequency may be made considerably smaller than . At large enough density of the stimulated radiation it is possible to get . This means that the metastabl state of the nanosystem can be transformed in the dipole radiating state. The authors are thankful to Professor Singh P. and Dr. Mulugeta B. for useful discussions of the results obtained in the paper. Authors are thankful to the School of Graduate Studies of Addis Ababa University for a financial support. M. Bedoya and A. S. Camacho, “Nonlinear Intersubband Absorption in Asymmetric Quantum Well Structures,” Physical Review B, Vol. 72, No. 15, 2005, pp. 1-7. M. Razavy, “Quantum Theory of Tunneling,” 1st Edition, World Scientific Press, Hackensack, 2003. J. P. Einstein, L. N. Pfeiﬀer and K. W. West, “Independently Contacted Two Dimensional Electron Systems in Double Quantum Wells,” Journal of Applied Physics, Vol. 57, No. 2324, 1990, pp. 2324-2326. J. P. Einstein, L. N. Pfeiﬀer and K. W. West, “Field-Induced Resonant Tunneling between Parallel two Dimensional Electron Systems,” Journal of Applied Physics, Vol. 58, No. 14, 1991, pp. 1497-1499. J. R. Singer, “Masers,” John, Wiley, and Sons Inc, New York, 1959. C. S. Park, M. G. Jeong, D. K. Park and S. K. Yoo, “Double-Well Potential: The WKB Approximation with Phase Loss and Anharmonicity Effect,” Physical Review A, Vol. 58, No. 3443, 1998, pp. 1-14. D. Y. Song, “Tunneling and Energy Splitting in an Asymmetric Double Well Potential,” Annals of Physics, Vol. 323, No. 2991, 2008, pp. 1-14. D. Braun and J. Martin, “Spontaneous Emission from Two Level Atom in Double Well Potential,” Physical Review A, Vol. 77, 2008, pp. 1-10. E. Merzbacher, “Quantum Mechanics,” 3rd Edition, John Wiley and Sons press, New York, 1970. L. D. Landau and E. M. Liftshitz, “Quantum Mechanics,” 3rd Edition, Pergamon Press, London, 1977. 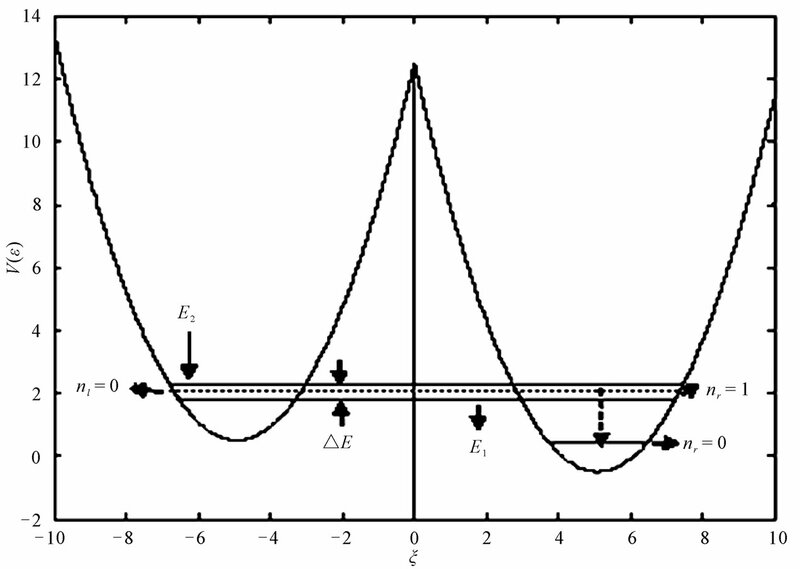 S. A. Savinov and V. N. Mursin, “Energy Filtration Effect and the Posibility of the Generation of Terahertz Radiation in Resonant Tunneling Structures with Several Quantum Wells,” JEEP Letters, Vol. 93, No. 1, 2011, pp. 155-160.